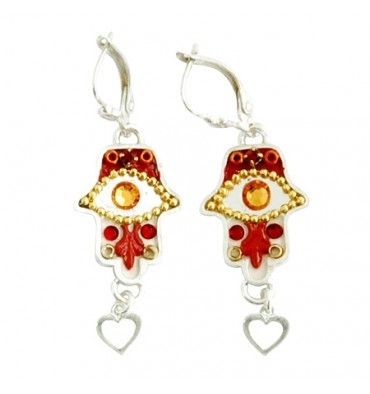 Handmade by the designer, these Hamsa earrings are made from sterling silver and covered with Swarovski crystals, brass and copper accents and beads. Hamsa hand is a traditional symbol for good luck in the Jewish tradition. Ester Shahaf, a renowned Israeli Judaica and jewelry designer, skillfully combines western and oriental influences to create her distinctive look. These earrings make a lovely addition to any outfit!